The picturesque coastline of Pembrokeshire has inspired luxury Welsh housebuilder Waterstone Homes to bring Wales its very own Sandbanks, drawing inspiration from the renowned millionaires’ playground in Dorset. Famed for its stretch of golden sand, show-stopping modern mansions and celebrity residents, including football managers Harry Redknapp and Tony Pulis, the Sandbanks peninsula boasts one of the most exclusive and expensive postcodes in the UK, taking the prize for Britain’s priciest seaside town. And now, Broad Haven is set to welcome its own Sandbanks, with a brand-new multi-million-pound luxury property development, ‘Sand Banks’, set to grace the beach-front. Sharing similar waterfront views and an abundance of natural beauty as its English namesake, the new Waterstone Homes development, which is just a five-minute walk away from the sea, will offer stunning shore-side homes at a fraction of the cost of its multi-million-pound English counterpart. 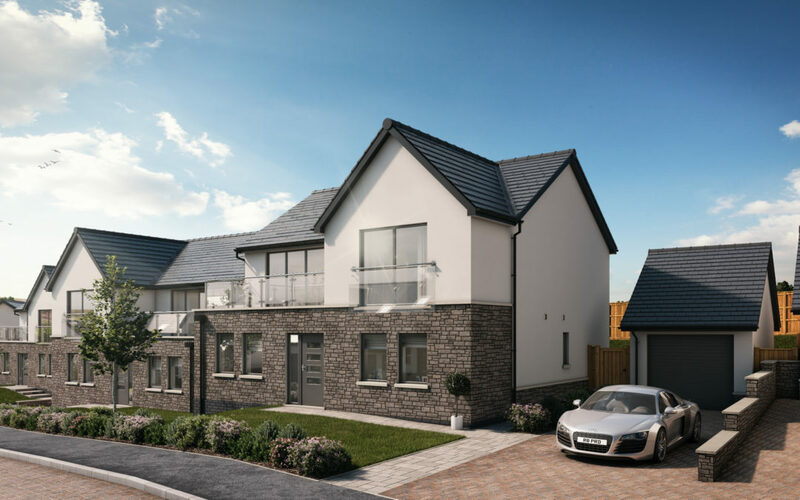 The exclusive new development will consist of just 17 three-storey, four and five-bedroom family homes, each featuring large open-plan spaces, private garages and driveways, as well as bright rooms thanks to a focus on glass within the design. The site also benefits from being just a skip and a jump from Wales’ famous coastal path, a stone’s throw from the stunning beaches of Newgale and Little Haven and just a 30-minute drive away from the UK’s smallest cathedral city, St Davids. With prices ranging between £460k and £560k, prospective buyers will be able to snap up a luxury home for a tenth of the cost of an average property in Dorset’s Sandbanks. Often cited as one of the most desirable place to live in Wales, Broad Haven shares many similarities with the English gem, from a spotless blue flag beach and clean sea, to spectacular views and rich wildlife. Plus, with a harbour nearby in Little Haven, residents could even sail between the two destinations. Speaking about the new development, Andrea Gardner, Sales & Marketing Director at Waterstone Homes said: “Broad Haven is an absolutely beautiful area and was the perfect spot for our latest sea-side location. With its award-winning sandy beach, breath-taking views and tranquil setting, Broad Haven shares many similarities with Sandbanks in Dorset and definitely deserves to receive the same level of recognition and prestige. Properties at the site are currently on sale with the development due to be completed in March of 2019.